Another premiere local drama is coming to ABC1, this time the telemovie Parer’s War starring Matt Le Nevez. Le Nevez stars as cinematographer Damien Parer, the first Australian to win an Academy Award, and whose footage of troops fighting World War II impacted on our view of the war. This will air on Sunday April 27, but will go up against the Logie Awards on Nine. It’s 1942 – Darwin has been bombed and 29-year-old, war time cinematographer Damien Parer (Matt Le Nevez), is filming Australian troops as they fight the Japanese on the deadly razorback ridges of New Guinea. Risking his own life, Damien is determined to make the film that will shake Australians out of their complacency and let them know that the war is on their doorstep. While away, his thoughts frequently stray to his beautiful, strong-willed and feisty, long-time girlfriend Marie Cotter (Adelaide Clemens). He knows that he has been keeping her at arm’s length – terrified that he will come home maimed and broken – unsure of his own feelings and unable to commit. Returning home to Sydney, Damien’s film is released, Kokoda Front Line! It’s a triumph and a bona fide hit, with crowds lining up at the theatres to see it. The film, produced by legendary Cinesound producer Ken Hall (Rob Carlton), is the first Australian film to win an Oscar. But when Damien learns that one of his images has been improperly released to the papers, potentially endangering the lives of the troops, it sets him at loggerheads with his boss at the Department of Information, the officious Bob Hawes (Nicholas Bell). Meanwhile his relationship with Marie doesn’t fare any better when he instigates a self-destructive fight with her. 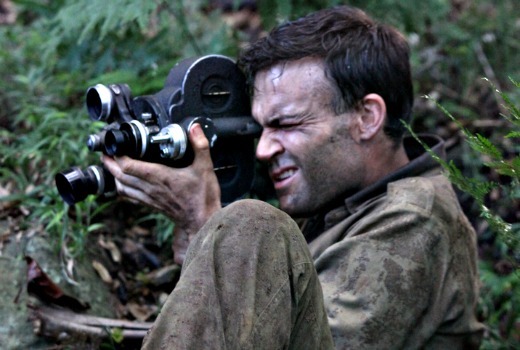 When Damien returns to New Guinea, he has another film in mind – to record the real life of a solider – the truth about war in all its shocking, intimate and frightening reality. Amidst the turmoil his camera is broken. His shield is gone. Damien vows to return to find Marie. Based on the lives of real people and actual events, Parer’s War tells the story of a man caught between two worlds and battling with his emotions – at ease amongst the troops and in the midst of jungle warfare, but struggling to connect at home and to win the love of his life. I don’t have a problem with them playing it on a Sunday. I like it. I won’t claim the rest of the audience will. I’ve seen an ad for it and it looks good. I just hope they don’t go for crass advertising that supposedly by the power of magical thinking attracts the audience even though at best it is annoying and destroys trust. Thank you David for mentioning this. They should screen this two days earlier, on Anzac Day.